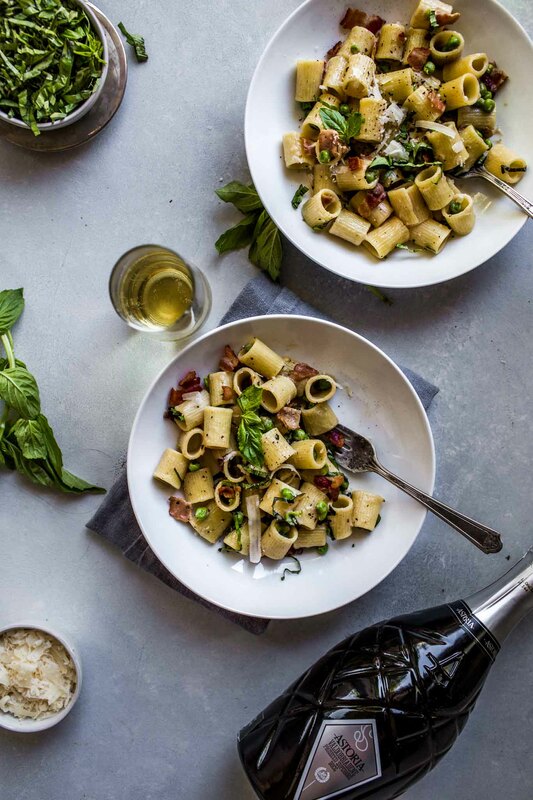 This recipe for Pea & Bacon Pasta came about on a chilly, rainy day. I hadn’t been to the grocery store in a week and really did not want to head out on this chilly, wet, typical Oregon day. Instead, I put on my yoga pants, turned on the TV, and started scouring the cupboards thinking up ideas for dinner. Peas from the freezer (always on hand in case anyone sprains an ankle). Half a package of rigatoni, leftover from the last time I enjoyed some Sunday Gravy. The last little bit of cream cheese in the package. The result? 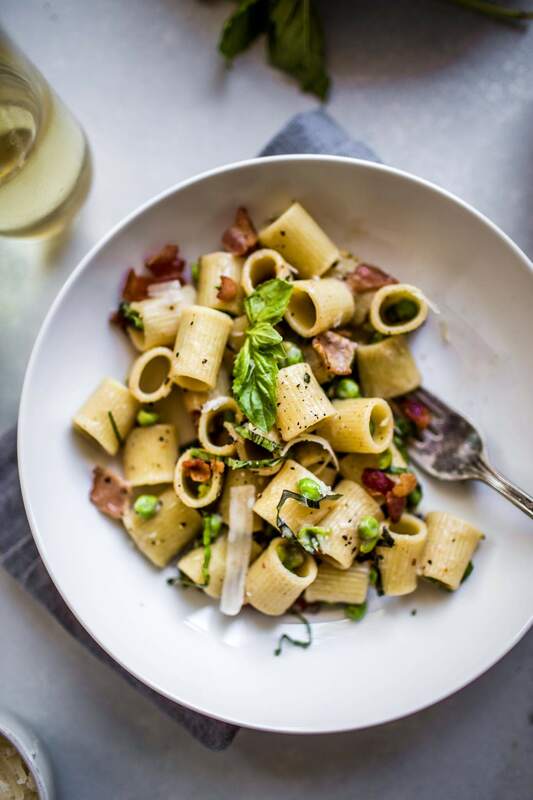 A creamy bowl of pasta goodness flecked with bits of smoky bacon and peas. Vegetables, carbs, dairy, protein – Right? And even though it was a basic Tuesday night… I decided to pop open some bubbles too! I always say, you don’t need a special occasion to enjoy some sparkling wine, especially when there are so many affordable options out there. Prosecco Superiore D.O.C.G. wines are some of the most delightful, affordable sparkling wines that you can find. Most are in the $15 – $60 range. They come from the northeast of Italy in a region called Conegliano Valdobbiadene (roughly 30 miles from Venice), the historic heart and origin of the Prosecco tradition, where a vast majority of the wineries are family owned, and have been operating for generations on end. Prosecco Superiore wines features fine, elegant bubbles and aromas of green apple and melon. They are incredibly food friendly, and can elevate any night, even a Tuesday. 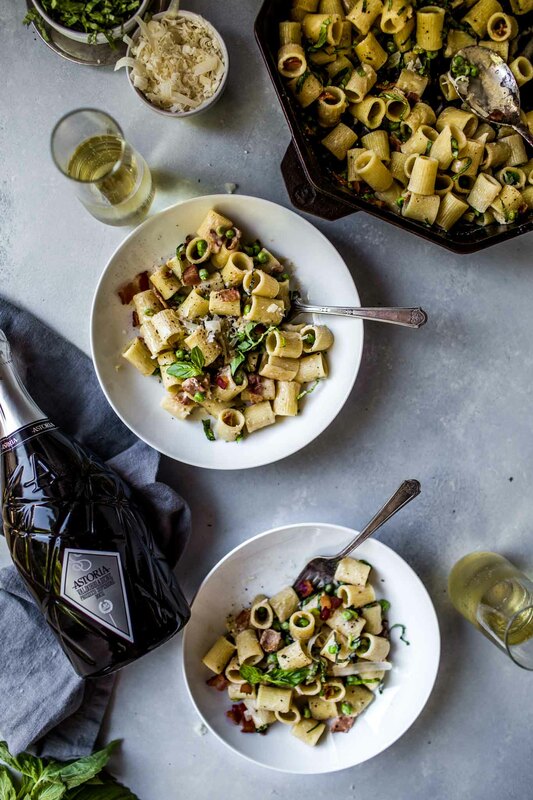 So arm yourself with a budget-friendly meal and a budget-friendly bottle of fancy Prosecco Superiore. Then you can decide whether you want to invite company over, or just enjoy this yummy dinner on your sofa in your PJs. Regardless, your night will be elevated with this yummy pairing. 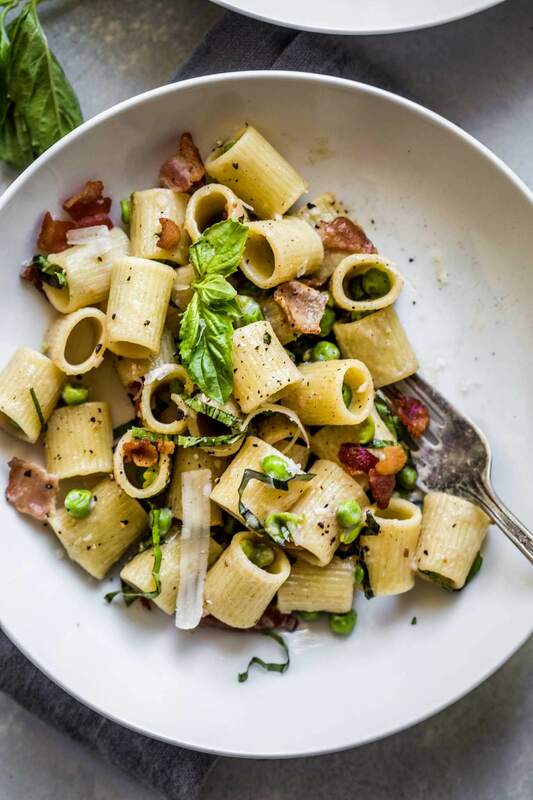 If you loved this Pea & Bacon Pasta I would appreciate it so much if you would give this recipe a star review! Also, be sure to snap a picture of your finished dish and share it with me on Instagram using the hashtag #platingsandpairings and tagging me @platingsandpairings. 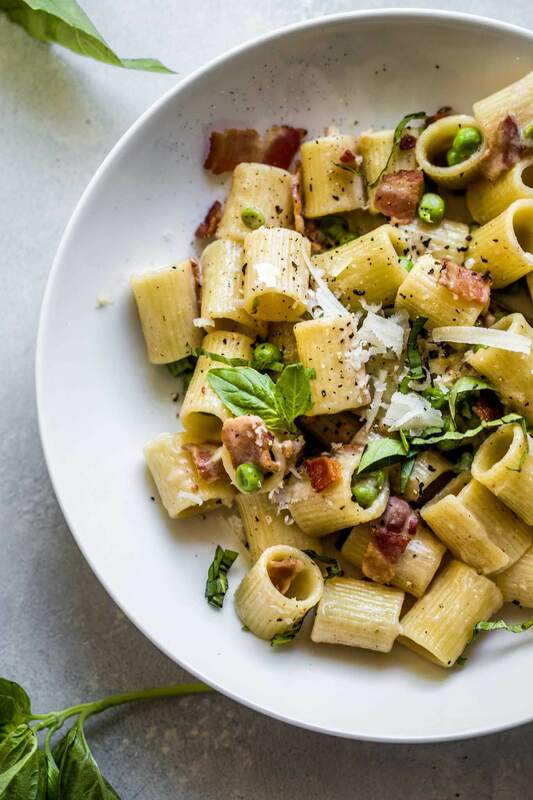 This Pea & Bacon Pasta comes together in just 20 minutes! 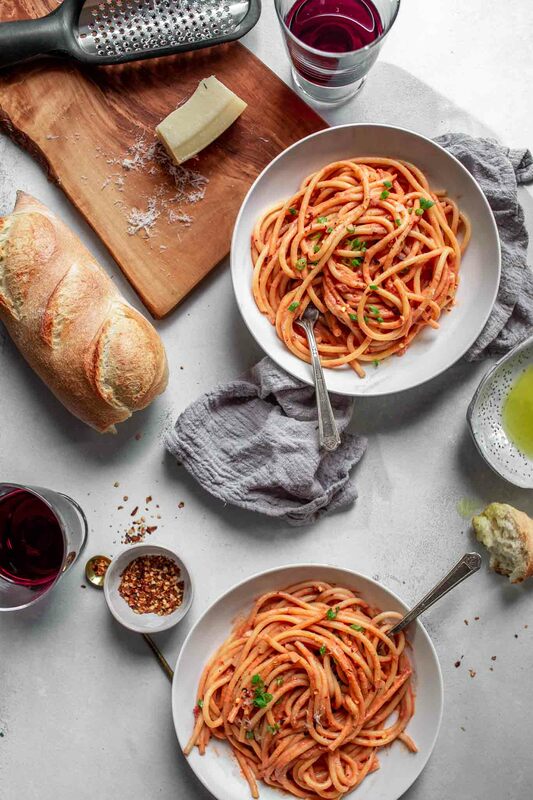 It's a delicious (and budget friendly) dinner that's perfect for any night of the week. Bring large pot of salted water to boil, over high heat. Add pasta and cook until al dente. Drain, reserving cooking liquid. Fry chopped bacon over medium heat, until crisp. Set aside on paper towels, and drain fat from pan. Add butter to pan over medium heat. Once butter has melted, add garlic and heat 3-5 minutes. Add in peas, milk and cream cheese. Bring to boil and simmer on low for 5 minutes. 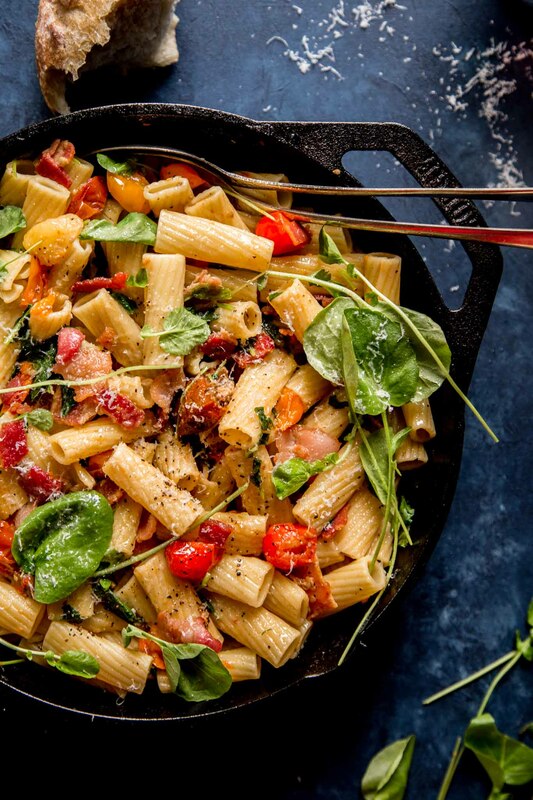 Add bacon back to pan, along with basil and salt and pepper, to taste. 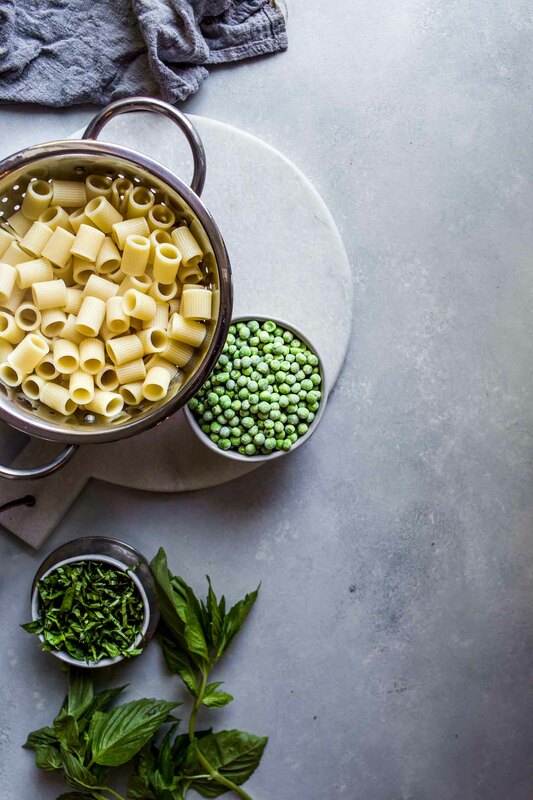 Toss cooked pasta with sauce, along with reserved pasta water, as needed, to obtain your desired consistency. I teamed up with Prosecco Superiore D.O.C.G. to bring you this post. As always, all opinions are my own. Prosecco Superiore D.O.C.G. wines. The bubbles cut through the richness of this sauce and the light body doesn’t overpower the fresh flavor of the peas. Pinot Gris. 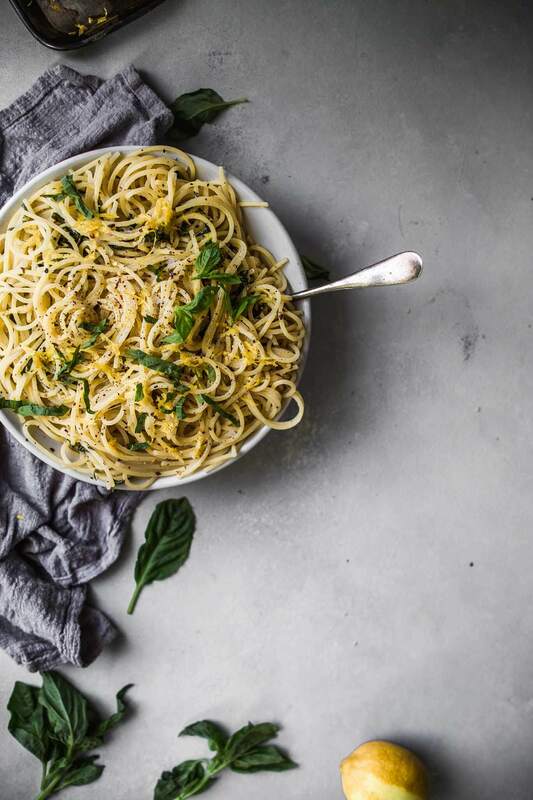 It’s tartness will also balance nicely with this creamy pasta.